AToM stands for Any Transport over MPLS, a quite reassuring technology which, provided you have a MPLS enabled network and some good gears, let you set up L2 circuits across your IP backbone. 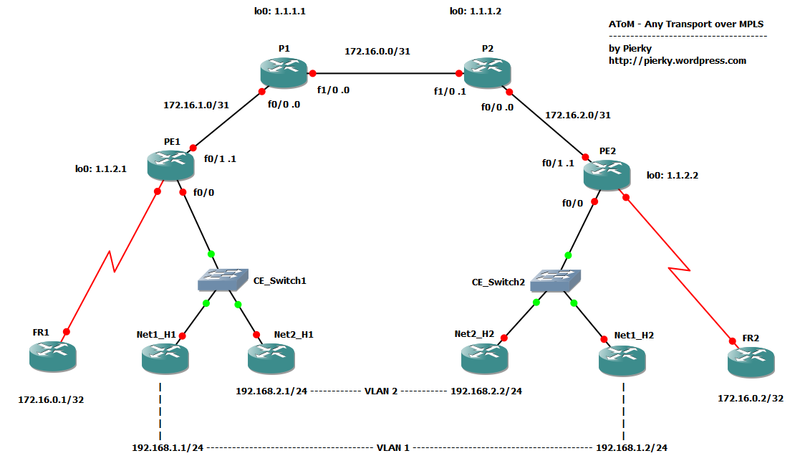 This lab offers a very simple topology with 2 AToM links; an ethernet with an 802.1q trunk and a frame-relay link. Core (P) routers configuration is pretty simple; we only enable MPLS switching on interfaces toward PE routers and setup LDP for labels exchange. A good core doesn’t care about what kind of traffic it switches! The hard work is done on PE routers. PE routers face CE routers, which they receive L2 traffic from, and network core P routers, which they have to send MPLS encapsulated traffic to. In order to build up a L2 circuit, PE routers have to setup a pseudowire connection between them, so they know how to switch traffic. Each pseudowire uses a virtual-circuit ID (VC ID), which is locally significant on each PE pair and is used to identify the pseudowire itself and to bind it to a specific MPLS label. Now, we have to set up pseudowires between PE and L2 connections with CEs. Let’s start with the Ethernet 802.1q trunk. In port mode EoMPLS every frame received on a PE interface is forwarded to the other PE almost unchanged (just preamble and FCS are removed). The xconnect command does all the work! This command tells the PE router to encapsulate every frame in a MPLS packet and to forward it to the peer 1.1.2.1 using VC ID 10. It also allow Label Distribution Protocol (LDP) to exchange informations about the pseudowire circuit between PEs (VC ID / label mapping, VC type, MTU). Frame-relay over MPLS requires a few more lines of configuration, but the pseudowire setup is the same as EoMPLS. With this configuration we have DLCI 102 for FR1-to-FR2 traffic, and DLCI 201 for FR2-to-FR1 traffic. Please note how the subnet 172.16.0.0/32 on the FR routers does not conflict with 172.16.0.0/31 between P routers; it’s on a totally different L3 domain and it is not routed by the network, but transparently encapsulated in L2 over MPLS packets. You can find some nice packet captures about this lab at PacketLife.net Captures section, under the MPLS category; they have been taken on P1-P2 link, with inner (pseudowire) and outer MPLS label on top of every packet. They are “LDP_Ethernet_FrameRelay”, which shows how LDP setup the pseudowire circuit, “EoMPLS_802.1q” and “Frame-Relay over MPLS”, which show an ICMP ping encapsulated in Ethernet and Frame-relay respectively. Anyway, if you don’t know PacketLike.net you must take a tour of that great website, really worth it! This post only shows a little basic configuration of some AToM solutions; there are many more capabilities than which I wrote on this blog. A good starting point is to read documents you can find using links below. If you want to download this GNS3/Dynamips lab, you can find it here.